There’s simply nothing better than a piping hot, creamy cup of coffee in the morning. For many people, that first cup of joe is what many people look forward to when they get up in the morning. But while there’s that specific demographic who loves their coffee black, there are plenty more who love a cup of coffee with some cream. Some like just half a teaspoon, while others love to load up their cup with their coffee creamer of choice. And since fat is the main source of energy on the ketogenic diet, creamer seems to fit in quite well in this particular lifestyle. So what better way to add fat to your diet than with some keto coffee cream in your coffee? But don’t count on your local Starbucks to fuel you with healthy fats in their beverages. You’ll often find many of their beverages loaded with sugar and other additives that are not keto-friendly. That is one of many reasons you should start looking for the best keto coffee creamers. Don’t let the term “creamer” fool you – many of the creamers on the market have little real cream and a lot of other junk. In fact, many creamers are basically just corn syrup solids, which is just a fancy name for sugar, except it’s made from corn. What gives these types of creamers their creamy consistency is partially hydrogenated soybean oil or cottonseed oil. These products also tend to contain sodium caseinate, which is a milk protein that is only meant to make sure the product maintains a long shelf life. A lot of people opt for creamers over real cream because they’re non-dairy, which can be helpful for those who may have some sort of allergy or sensitivity to lactose or some other milk protein. But many products use artificial ingredients, despite the fact that they’re touted as being non-dairy and therefore not healthy for those with a problem with dairy. Should You Avoid Coffee Creamers On Keto? Coffee creamers can be great additions to your coffee. But as mentioned above, it’s important to be careful of the exact type of creamer you’re consuming, or else you could be finding yourself being kicked out of keto. When it comes to following the ketogenic lifestyle, your best bet is to focus on more natural coffee creamer products that aren’t loaded with ingredients that might kick you out of ketosis. The majority of coffee creamers you see on grocery store shelves aren’t even made with cream, despite their names. Instead, they feature thickening agents to give coffee creamers the creamy texture that you might be looking for. Most commonly, carrageenan is used as a thickening agent, which can be carcinogenic to humans and may also be associated with gastrointestinal issues. Other thickening agents to avoid include cellulose gum and cellulose gel, both of which come from cotton or wood pulp. Also, stay away from polysorbate 60, which comes from sugar alcohol and is designed to prevent oil and water from separating. All those flavors and aromas of hazelnut, coconut, or vanilla that are found in traditional coffee creamers aren’t real at all. Anything that is artificial in nature can have potentially harmful chemicals. Side effects of ingesting artificial flavors include headaches, gastrointestinal issues, and even depression. As such, you’d be well-advised to avoid any creamers – or any other type of food – that contains a long list of artificial flavors. Many coffee creamers are able to maintain a long shelf life simply because of the loads of preservatives that are found in them. But preservatives are associated with a host of hazardous side effects, including allergies, headaches, heart palpitations, hormone imbalances, and potentially even cancer. Some sweeteners are natural while still providing the product with a sweet taste without the sugar. But others are artificial in nature, and as such, you should try avoiding them. Natural sweeteners like stevia, erythritol, and monk fruit are healthy and keto-friendly. But others that don’t come from natural sources should be steered clear of. These can include aspartame, sucralose, and acesulfame, which may be linked to a higher risk of diabetes, heart disease, high blood pressure, and even obesity. Added sugars or partially hydrogenated oils. If the creamer isn’t sweetened with anything, odds are it’s got sugar in it. Obviously, sugar is the last thing you should be consuming if you’re on a ketogenic diet, so be sure to avoid any coffee creamers that contain sugar. Not only that, but many coffee creamers feature partially hydrogenated oils that serve as preservatives. These particular oils go through a hydrogenation process that alters their chemical profile, making them completely void of any nutritional value. They also have trans fats, which is linked to inflammation. So what types of creamers are out there that would make the perfect addition to your low-carb, keto-friendly diet? If you love your coffee and are looking for a quality creamer to add to your morning cup of joe while maintaining ketosis, the following products top the list. You can achieve best results with your keto diet if you focus on high-fat foods, and heavy cream certainly fits the bill. Heavy cream is basically a thick cream that has a lot of butterfat in it. It’s the fatty component that rises to the top of milk when it’s allowed to rest and is then skimmed off. The cream is thick and rich and makes a perfect accompaniment to coffee. The actual type of cream is classified according to its fat content. You can find heavy cream with anywhere between 36% and 40% fat content. Or you can also make a double cream. That’s why heavy cream is an ideal keto-friendly substitute to other coffee creamers or even milk. It’s great for low-carb diets like the keto diet and is a great way to add some rich creaminess and flavor to your coffee without spiking your carb intake. The great news is that you can get heavy cream from just about any supermarket. If you’re looking for the perfect supplement to add to your morning coffee and your keto diet, then Perfect Keto’s coffee creamer is a great addition to make. The main ingredient is MCT oil, so you know that it’s going to be an ideal product to add to your regimen. 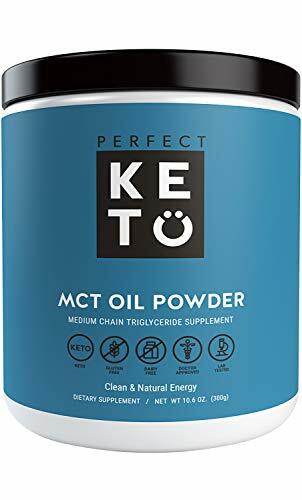 MCT oil helps with the production of ketones, which is why it’s such an important part of the keto diet. MCTs are easily digested and provide a burst of energy that lasts for hours. Perfect Keto’s MCT Oil Coffee Creamer powder is creamy, rich, smooth and adds a wonderful and delicious texture and taste to your coffee. And with the salted caramel or chocolate flavors, you can make your homemade brew rival the flavor of your favorite Starbucks beverage – at a fraction of the cost. Of course, you can always get the unflavored version. Plus, it adds healthy fats to your favorite beverages too. This particular product doesn’t have any of those pesky fillers, fiber additives, or cornstarch. That means there’s no carbs or sugar, and just pure MCT fats from coconut. Not only will this creamer add an awesome creamy texture to your coffee, but it’ll also help you feel fuller for longer and won’t jack up your blood sugars. 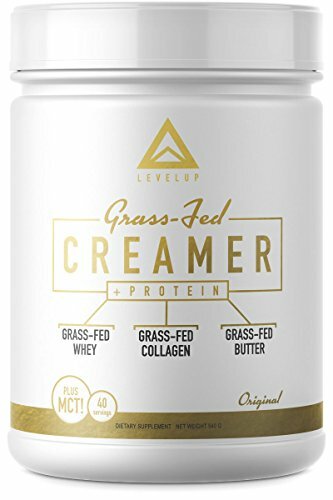 A great way to add a little grass-fed protein to your diet is to add some of Level Up’s coffee creamer. 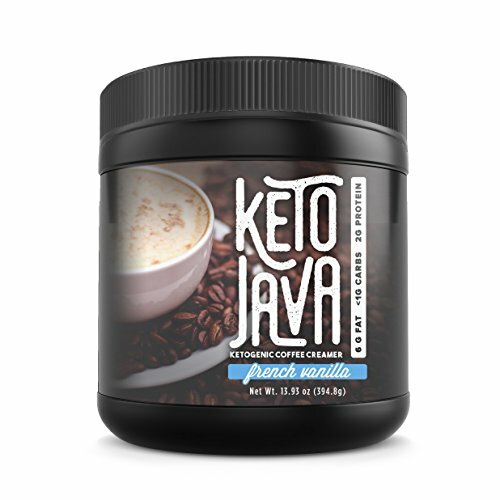 This product is perfect for “fattening” up your coffee the healthy keto way, all while providing you with a delicious way to start your morning. Level Up’s coffee creamer has less than 1g of net carbs for serving, so it fits in well with the keto diet regimen. It contains pure C8 caprylic MCT oil, the shortest of the MCTs, which makes it easier for the body to break it down into fuel. This provides for better ketone production to give you a quicker boost of long-lasting energy. The ingredients list is simple: you won’t find any artificial sweeteners, colors, or flavors; just all-natural, grass-fed protein and MCT oil to flavor up your coffee and help prime your body for some serious fat-burning. And at 40 servings per container, this product should last for the long haul. 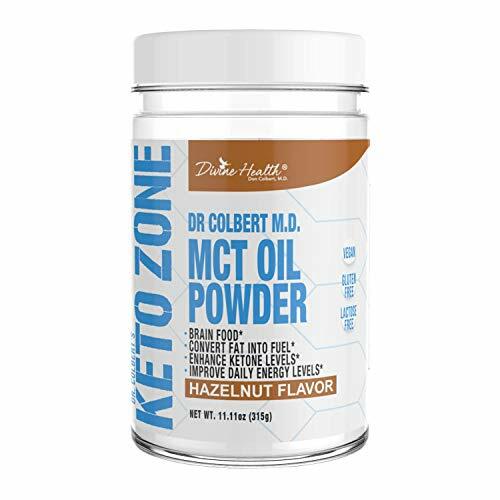 Another quality MCT oil product that’s great as an alternative to traditional cream for your coffee is Dr. Colbert’s Keto Zone MCT Oil Powder Coffee Creamer. It’s got a wonderful natural hazelnut flavor and instantly enhances the taste of your coffee – or any other beverage you’d like to add it to. There are no artificial sweeteners or flavors unlike many of the traditional coffee creamers out there. This creamer is great for turning your coffee into a creamy, delicious treat, all while providing you with rich MCTs to help give your body a boost of energy and rev up your metabolism throughout the day. Not only can you add it to coffee, but you can also mix it in with your favorite shakes and keto-friendly baked good recipes. And the zero net carbs helps you ensure you stay in a ketogenic state. There’s no need to settle for greasy MCT oils to jack up your bulletproof coffee thanks to Keto Java’s Coffee Creamer. This product comes in a convenient and portable powder form that gives your coffee a creamy texture without the mess. It can help you burn fat faster, boost your energy levels, and put you into ketosis quickly and keep you there. You’ll get a subtly sweet taste without kicking you out of ketosis thanks to this creamer’s natural Stevia-sweetened formula. At less than 1g net carbs per serving, this is a great product to add to your repertoire. You can use it both hot or cold drinks, so it makes a great coffee creamer whether you prefer a traditional hot coffee or even an iced drink. You can even add it to your smoothies! 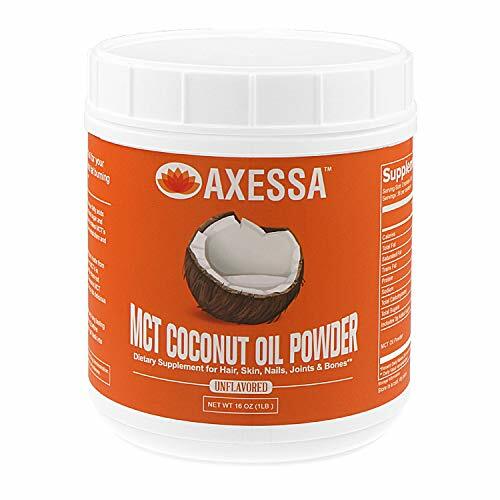 Maintaining a state of ketosis while enjoying a tasty cup of coffee is easy with Axessa’s MCT Coconut Oil Powder Alternative Coffee Creamer. This product is made with 100% ketogenic-friendly ingredients, such as non-GMO coconuts. This creamer contains a unique fatty acid profile that has the remarkable ability to stabilize blood sugar and boost ketone body production to keep you energized and burning fat for longer. This MCT coconut oil is a free-flowing format that comes in powdered form, making it convenient to carry when traveling. So there you have it– these coffee creamers would make the perfect addition to your coffee, or any other beverage that you enjoy. The key is to find a creamer that’s void of anything artificial, has no sugar, and is able to help you maintain your ketogenic lifestyle.